Virat Kohli achieved the feat in just 24 Tests as compared to Sourav Ganguly, who recorded 11 away wins in 28 Test matches as captain. Virat Kohli on Sunday equaled former skipper Sourav Ganguly's feat of most overseas Test victories as India captain. 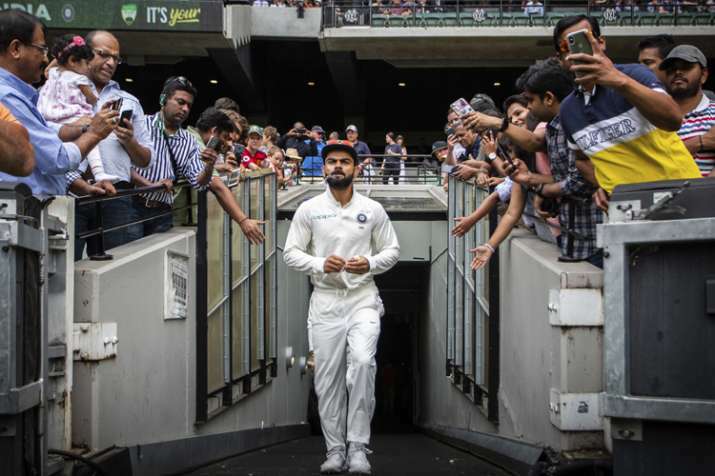 The massive 137-run win against Australia at the MCG was Kohli's 11th away Test victory, making him the joint-most successful Indian Test captain in overseas conditions. Kohli achieved the feat in just 24 Tests as compared to Ganguly, who recorded 11 away wins in 28 Test matches as captain. The 30-year-old also became the first Indian captain to retain the Border-Gavaskar Trophy in Australia while his team became the first Indian team to win a Boxing Day Test Down Under. However, Kohli said his team is not done yet and will not rest until they win the last Test in Sydney, starting from January 3. "We are not going to stop here. This (win) will give us more confidence and we will play more positively in Sydney. I think we have been really smart in all the departments in the two matches that we have won. That is the reason we have at least retained the trophy but the job is not done yet," Kohli said. "It's not finished at all. We want to win the last Test match as well, if an opportunity comes our way. We don't want to be complacent. We are all but ready for the final Test match," he added.